Movie Review: Competent Italian filmmaker, Matteo Garrone, who over the last few years has been giving us memorable films such as “Gomorrah” and “Reality”, hauls us into three Baroque tales from the 17th century, in which the real and the unreal go hand in hand. The director, who exquisitely and efficaciously brings in mystical elements and dreamlike sequences, mixing them with the ethereal music by Alexandre Desplat, combines fulgurant medieval settings to host the odd stories, loosely adapted from the fairy-tale collection ‘Il Pentamerone’ by the Neapolitan poet, Giambattista Basile. The first tale tells us about an anguished queen (Selma Hayek) who can’t cope with the impossibility of having children. However, a sinister occultist offers her the solution – the king (John C. Reilly) has to kill a sea monster and rip its heart out, to be cooked by a virgin and eaten by the queen. That way, she will become pregnant immediately. The vaticination comes true, and the queen acts radiant, even losing her husband in the risky sea hunt. What wasn’t explained, was that the virgin who cooked the heart would also get pregnant of a boy who looks exactly the same as the prince, and that they will be forever inseparable. Another tale takes us to an odd king (the unique Toby Jones) who lives with his young daughter, Violet (Bebe Cave). While the daughter sings to him, his attention goes entirely to a flea that hops on his hands. Over the following years, he secretly nurtures the flea, which turns into a gigantic creature. When the flea dies, he decides to exhibit its skin and give his daughter as a bride to whoever guesses its origin. A brute Ogre was the one who wins the trophy, taking the terrified Violet to his dungeon in the highest of the mountains. The last tale is about a lustful king (Vincent Cassel) who falls in love with the angelical voice of a woman whom he has never seen the face. This woman is a wrinkled old woman who surrealistically manages to become young again, leaving her aged sister lonely and jealous. I have to admit that my enthusiasm was let a bit down by an out-of-the-blue conclusion that certainly hides inscrutable philosophical meanings. 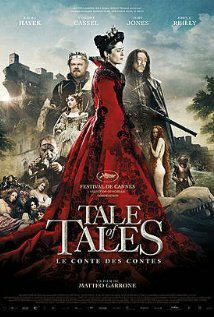 Anyway, “Tale of Tales”, the first English-language film from Mr.Garrone, bewitched me somehow with its extraordinary, recondite mood.